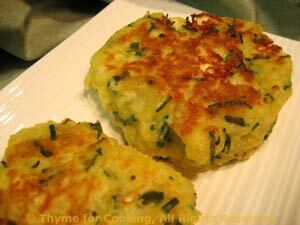 Potato Cakes with Feta, Chives, easy side dish, healthy gourmet cooking. Peel the potatoes cut into chunks. Drain the potatoes and mash with a fork or potato masher. Spread the mashed potatoes on a plate to cool for 5 minutes. Divide into 4 equal portions. Heat oil in large nonstick skillet. Add potato portions, forming into patties in the skillet, about 1/2" (1.25cm) thick. Fry until brown on one side, about 7 minutes.